Blood donation is important. Blood contains components that are essential to life. Donating blood helps to have it readily available for people who need blood due to injury, illness, or surgery. Donors actually like to give because it makes them feel charitable and proud and sometimes there are incentives offered. Have you wondered if people with rheumatoid arthritis or other rheumatic diseases able to donate blood? Does their disease or their prescribed treatment preclude them from donating blood? We asked rheumatologist Scott J. Zashin, M.D., who explained, "Patients with Sjogren's syndrome, lupus, and scleroderma are not able to donate blood. Most patients with rheumatoid arthritis are not able to donate. There are a number of reasons blood donation is not permitted in these cases. First, many patients will be anemic. Secondly, many patients will be on DMARDs (disease modifying anti-rheumatic drugs), which include methotrexate and Plaquenil (hydroxychloroquine)." Dr. Zashin continued, "Rheumatoid arthritis patients only on NSAIDs (non-steroidal anti-inflammatory drugs), such as ibuprofen, may be permitted to donate. Policies at each blood bank may differ. 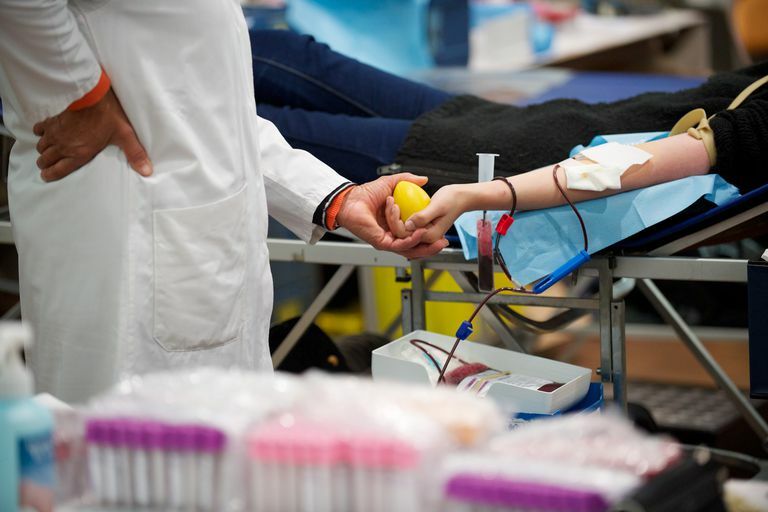 If you are considering a donation, be sure to check with your local blood bank and provide them with your diagnosis and a complete medication list. Also, if you do plan to donate blood, make sure you feel well." According to the Red Cross, "Most chronic illnesses are acceptable as long as you feel well, the condition is under control, and you meet all other eligibility requirements. In most states, donors must be age 17 or older. Some states allow donation by 16-year-olds with a signed parental consent form. Donors must weigh at least 110 pounds and be in good health. Additional eligibility criteria apply." You should postpone your donation for 3 days if you take prescription medications, excluding paracetamol, anti-histamines or sedatives provided they are not taken for fever/flu/illness, e.g., NSAIDs such as diclofenac, ibuprofen, naproxen, or aspirin, except if taken for heart disease, stroke, or other medical conditions, which make the donor ineligible for blood donation. American Red Cross. FAQ. Missouri-Illinois Blood Services Region. Copyright 2014. American Red Cross. Eligibility Requirements. Which Arthritis Medications Cause Hair Loss? Can You Drink Alcohol When Taking Arthritis Drugs? What Do Blood Tests Reveal About Arthritis? Should Patients Steer Clear of Expired Medications?